Sceptical views on the Catalonian independence movement of 2017 from Miguel Amorós and Tomás Ibañez, who basically maintain that anarchists who join in the nationalist movement, a movement based on mass psychosis and the “marketing” of illusory identity politics (“the Catalonian people is just as abstract a concept as the Spanish people”), thinking they are taking advantage of an opportunity to advance their cause, are being cynically used as the “popular backdrop for a bad play in which an ordinary redistribution of power is being publicly screened”, and later “will have to be punished for snatching their [the Catalonian ruling class’s] chestnuts out of the fire”. Your “untimely perplexities” are the best example I have ever read of the common sense and revolutionary seny [Catalan: power of discernment] that must reign not only among libertarians, but among all those who want to abolish this society rather than manage it. It does seem odd to me, however, that a lot of people who claim to be anarchists have latched onto the nationalist movement and have enthusiastically proclaimed the right to decide the kind of material their chains will be made of: reminiscent of Ricardo Mella and “the law of numbers”! Nor is there any shortage of those who, in its time, jumped aboard the Podemos bandwagon, or rallied to Platformism, and exchanged the rags of the class struggle for the new clothes of civil society. The standard response of philistine anarchism to any historical dilemma is to opt for playing the game of established Power. The Spanish civil war is the most compelling example of this. Confusion, the irresistible attraction of a good brawl, the dissolution of class identity [desclasamiento], the tactic of the lesser evil, the enemy of my enemy, and so on. The final result: a mass of dumb rubes enslaved by one or another cause that is not their own, and a crowd of sick egos along the lines of Colau or Iglesias who are paid to sell themselves. In short, the horizon is obscured by black storm-clouds that prevent us from seeing clearly. Let us try to dissipate them. The question that should be asked is not why a local sector of the ruling class has decided to resolve its differences with the State by means of mass demonstrations, but why a considerable number of people with entirely different interests, young people for the most part, are playing the part of movie extras and street brawlers for the caste that has turned Catalonia into its own patrimony, a caste that is just as Catholic, corrupt, authoritarian and class-bound as any other. The game of Catalonian patriotism is not that complicated, and those who promote it and are taking advantage of it have sought to conceal its meaning. The “Procès” has been an audacious class project. The consolidation of a local caste associated with economic development required a qualitative leap in terms of autonomy that the “peix al cove” (“bird in the hand”) strategy was incapable of achieving. The refusal of the central plutocracy to engage in “dialogue”, that is, to transfer official responsibilities for decision-making, principally financial, hindered the rise of this caste and dangerously reduced its political influence and capacity in the eyes of certain employers, industrialists and bankers who were prepared to allow themselves to be led by pro-sovereignty elements in order to triple their profits. The high-level decision to opt for a “train wreck” signified a radical break with the compromise-oriented policies of political Catalanism. They were not really serious, that is, they never really intended to make a unilateral declaration of independence, since they only wanted to force the central government to come to the negotiating table on more favorable terms. However, since they had to pretend that they were really serious, they needed a well-oiled machinery of agitation to inoculate their schemes with a patriotic mystique that would keep the identitarian pot at a steady boil. And the mobilizations really took place. It was all a big spectacle. The demagogy of the independentistas, armed with the marketing of identity, was capable of extending its reach into the democratic civil society movement and this made it possible to flood the streets with masses of people who were too domesticated to do so on their own account. It skillfully pulled the strings of repressed emotions and gregarious feelings that are so at home in the slaves of consumption, that is, it was able to stir up the dregs of alienation to its own benefit. The objective, in my view, was attained, and the leadership caste of the State is much more willing to modify the post-Franco constitution in order to more effectively integrate the Catalanist caste, although in order to do so the latter will have to sacrifice a few figures along the way, maybe even Puigdemont himself. Powerful representatives of big capital (Felipe González, for example) seem to be leaning in this direction. Nationalism is being manipulated by con-men, but it is not in itself a con game. It is the sentimental reflection of a frustrating situation faced by most atomized subjectivities. It is not rational, since it is not the fruit of reason; it is more of a psychosis than it is the heartbeat of liberation. The explanation for the blossoming of patriotic emotion in Catalonian society must be sought in mass psychology, and for this purpose, Reich, Canetti or even Nietzsche will be more useful than theoreticians like Marx, Reclus or Pannekoek. The conviction and the enthusiasm of the crowd are not derived from cold logical reasoning or from rigorous socio-historical analyses; instead, they have more to do with the risk-free indulgence in emotional displays, the sense of power that is produced by vast crowds of people, the fetishism of the flag or other symbols, the virtual Catalonian identity of the social networks, etc., all of which are characteristic of deracinated, atomized and déclassé masses, which are therefore also masses without values, goals or ideals of their own, masses predisposed to accommodate themselves to the millstones that are grinding them down. The everyday life colonized by the power of the commodity and the State is a life full of latent and internalized conflicts charged with an excess of energy that causes them to take the form of individual or collective neuroses. Nationalism, regardless of its particular reference, offers an excellent mechanism for channeling these impulses that, if they were to become conscious, might otherwise constitute a major factor of revolt. Nationalism divides society into two paranoid gangs that are artificially opposed to one another because of their obsessions. Material, moral, cultural, etc., interests, do not count. It has nothing to do with justice, liberty, equality or universal emancipation. 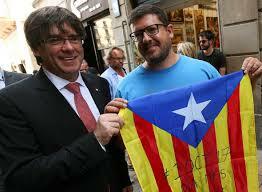 The Catalonian people is just as abstract a concept as the Spanish people, it is an entity that serves as an alibi for the sovereignty of a caste with its own notably repressive police force. A people is only defined as opposed to all power that does not emanate from it or which is separate from it. Therefore, a people with a State is not a people. You will agree with me that history is made by the common people by way of assemblies and institutions born from assemblies, but the way things are now, history is made by those who manipulate it most effectively. What these people are doing now is providing the popular backdrop for a bad play in which an ordinary redistribution of power is being publicly screened. Anyone can make their calculations and then navigate on that basis within or without the nationalist waters, now tossed by a rather mild tempest, but they will never be able to lose sight of the heart of the question. As you once said to me, perhaps we can still be useful by clarifying a few things. The truth is that, considering the confusion that prevails in so many respects, you were not so far off the mark. When we see changes as drastic as those that have taken place in Catalonia since the big demonstrations of May 15, 2011, it is hard not to experience a certain degree of perplexity. What could have happened that caused some of the most combative sectors of Catalonian society to undergo the transition from “besieging the Catalonian Parlament” in the summer of 2011, to wanting to defend the government institutions of Catalonia in September 2017? What could have happened that made these sectors, which once confronted the mossos d’escuadra in the Plaza Catalunya, and sought to hold them accountable for their savage crimes, such as the crimes against Esther Quintana and Andrés Benítez, now applaud their presence in the streets and express their fear that they might not enjoy complete autonomy in law enforcement? What could have happened to make parts of these same sectors, which once denounced the Catalonian Govern for its anti-social policies, to vote only a short while ago in favor of its budget? But we must also ask, what could have happened to make certain sectors of anarcho-syndicalism, which once asserted that freedom has never been attained by voting, now want to defend this civil right? The list of questions could be extended ad infinitum and we could provide numerous responses to the few that we have mentioned here. We could refer to factors such as the exhaustion of the cycle of ’78, the economic crisis with its corresponding cutbacks and part-time jobs, the right-wing government in power in Spain with its authoritarian policies and its hostility to civil liberties, the scandalous corruption of the majority party, etc., etc. It seems to me, however, that it would be naive to exclude from this list of responses one fact that must also be taken into account, the extraordinary increase in nationalist feeling. An increase that, without any doubt at all, has contributed to the factors referred to above but which has also been fueled by the structures of the Catalonian government itself, through its control of Catalonian public television. Several years of persistent excitation of nationalist fervor could only have significant effects on subjectivity, and all the more so insofar as the strategies to expand the base of pro-independence Catalonian nationalism have been, and still are, extraordinarily clever. The power of a narrative constructed on the basis of the right to decide, based on the image of ballot boxes and the demand for the freedom to vote, was extraordinary and succeeded in perfectly dissimulating the fact that this whole narrative was promoted by a government apparatus. Today, the estelada [the Catalonian flag] (red or blue) is, without the least doubt, the emotionally charged symbol behind which the masses are mobilized, and it is precisely this aspect that must not be underestimated by those who, although they are not nationalists, see the pro-referendum demonstrations as an opportunity that the libertarians must not fail to take advantage of in order to attempt to open up spaces for potential advances, and that revolutionaries, at least, as the bearers of a strong social agitation, should therefore plunge into the battle between the governments of Spain and Catalonia. This fact must not be underestimated because when a movement of struggle includes a significant nationalist component, and this is, without the least doubt, the case in the present conflict, the possibilities for an emancipatory change of its character are strictly null. I would like to share the optimism of the comrades who want to try to pry open some spaces in the current situation in order to create opportunities for emancipatory outcomes, but I cannot close my eyes to the evidence that popular insurrections and movements for social rights are never transversal, but always find the ruling classes circling their wagons on the other side of the barricades. At the same time, in processes involving self-determination, and the current movement is clearly of this type, a powerful inter-classist component always plays a part. These processes always unite the exploited and the exploiters in pursuit of a goal that never involves the abolition of social inequalities. The result, corroborated by history, is that processes of national self-determination always end up reproducing class society, and subjugate the popular classes after they have provided the bulk of the cannon fodder in these conflicts. This does not mean that we do not have to fight against the ruling nationalisms and seek to destroy them, but we must do so while constantly denouncing the ascendant nationalisms, instead of merging with them under the pretext that this joint struggle could give us opportunities to go beyond its own particular objectives and isolate those who are seeking to create a new national State that they can control. No one should have any doubts about this: these fellow travelers will be the first to repress us when they don’t need us anymore, and then we will have to be punished for snatching their chestnuts out of the fire.